Macron has never treated protesters as people who have legitimate claims, so he has never paid attention to their claims. He only agreed to suspend the additional fuel tax, which was to have been begun in January, and to grant a slight increase in the minimum wage — all of which he did only after weeks of protests. Journalists say that Macron thought the movement would fade away after the end-of-year break, that police violence and desperation would induce the demonstrators to resign themselves to their fates, and that the support of the general population would collapse. Nothing of the sort took place. Macron called for a “great national debate” to address the problems facing the country. It soon became clear, however, that the “great debate” would be unconventional, to say the least. Macron wrote a letter to all French citizens inviting them to “participate”, but saying explicitly that the “debate” would not change anything, that the government would continue in exactly the same direction (“I have not forgotten that I was elected on a project, on major orientations to which I remain faithful.”), and that everything that was done by the government since June 2017 would remain unchanged (“We will not go back on the measures we have taken”). He then entrusted organizing the “debate” and drafting its conclusions to two members of the government, and requested that “registers of grievances” be made available to the public in all town halls. Macron then launched the “debate” by meeting mayors of many cities, but not in public. He seems to have been concerned that if he organized meetings open to the public, he would be immediately chased away by crowds. The first two meetings took place in small cities (with 2,000-3,000 inhabitants), and with mayors whom the organizers — chosen by Macron — allowed to come. The organizers also selected the questions to be asked, then sent them to Macron to be answered at the meeting. The day before each meeting, the selected city was placed under the administration of legions of police. All access roads to the city were closed, and anyone found wearing a yellow vest or carrying one in his car was fined. All protests in the city were flatly forbidden. 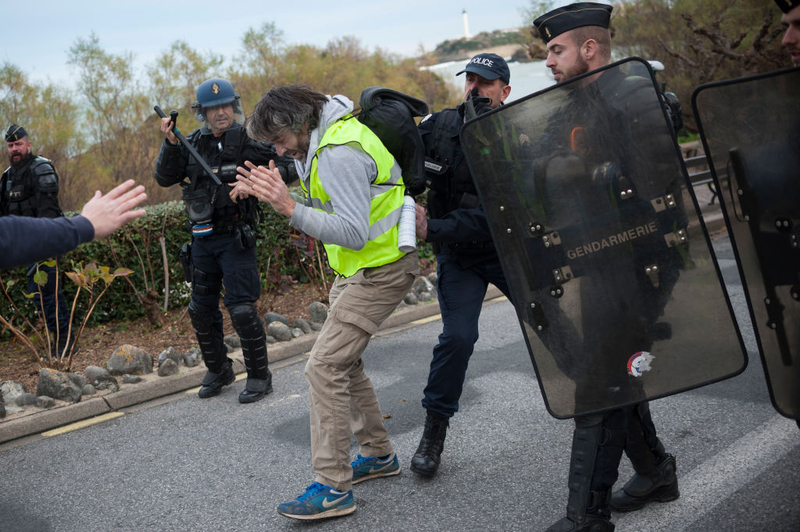 The police made sure that the road used by Macron’s convoy to reach the city was empty of any human presence for several hours before the convoy arrived. Television news channels were asked to broadcast the entire meetings, which lasted six to seven hours. Only a few journalists, also selected by Macron, had permission to attend. Several commentators stressed that pretending to “debate” is nonsense, and that entrusting the organization of the “debate” and the drafting of its conclusions to members of the government, and the way the meetings were organized, clearly show that these performances are a sham. Some commentators pointed out that the term “register of grievances” has not been used since the time of absolute monarchy, that mayors are treated as waxworks and that placing the cities Macron visits in a state of siege is unworthy of a democracy. A French economist, Nicolas Lecaussin, who grew up in Romania, wrote that these meetings reminded him of those in Romania during communism. The French economy is, in fact, sclerotic. The Index of Economic Freedom created by the Heritage Foundation and the Wall Street Journal ranks it 71st in the world (35th among the 44 countries in the Europe region) and notes that “the government spending accounts for more than half of total domestic output”. The Index also reveals that “the budget has been chronically in deficit“; that “corruption remains a problem and that “the labor market is burdened with rigid regulations” leading to a high level of unemployment. France has lost almost all its factories (industrial jobs account for only 9.6% of total employment). Its agriculture is in ruins, despite huge European subsidies: 30% percent of French farmers earn less than 350 euros ($400) a month and dozens commit suicide each year. In the high-tech sector, France is essentially absent. A brain drain has started that show no signs it will stop. In parallel, each year, 200,000 immigrants from Africa or the Arab world, often without skills, arrive. Most are Muslim and have been contributing to the Islamization of France. Guilluy (pictured), a geographer, published two books: La France périphérique (“Peripheral France”) in 2014, and, just weeks before the outbreak of the uprising, No society. La fin de la classe moyenne occidentale (“No Society. The End of the Western Middle Class”). In them, he explains that French population today is divided into three groups. The first group is a ruling upper class, totally integrated into globalization, made up of technocrats, politicians, senior civil servants, executives working for multinational companies, and journalists working for the mainstream media. The members of this class live in Paris and the main cities of France. The second group lives in the suburbs of the main cities and in no-go zones (“Zones Urbaines Sensibles“). It consists mainly of immigrants. The French upper class, who rule, recruit people to serve it directly or indirectly. They are poorly paid, but highly subsidized by the government, and increasingly live according to their own cultures and standards. The third group is extremely large: it is the rest of the population. It is this group that is called “peripheral France.” Its members are made up of low-ranking civil servants, blue collar workers and former blue-collar workers, employees in general, craftsmen, small entrepreneurs, shopkeepers, farmers, and the unemployed. For the ruling upper class, they are useless. The ruling upper class treat them as regrettable dead weight and expect nothing from them except silence and submission. Members of “peripheral France” have been driven out of the suburbs by the influx of immigrants and the emergence of no-go zones. These “peripherals”, for the most part, live 30 kilometers or more from the big cities. They can see that the upper class dismisses them. They often have a hard time making ends meet. They pay taxes but can see that a growing portion is being used to subsidize the very people who drove them out of their suburban homes. When Macron lowered the taxes of the wealthiest, but increased the taxes of the “peripherals” with a fuel tax, it was seen as the last straw — in addition to his arrogant condescension. Christmas reading: The inevitability of war. Conflict is in our nature.